Most themes use sidebar filters. Learn how to set the filters up horizontally with drop downs, in your theme (Advanced). Most of the theme installers we provide for the Filter Menu either add a sidebar, or add the filters to your theme's existing sidebar. 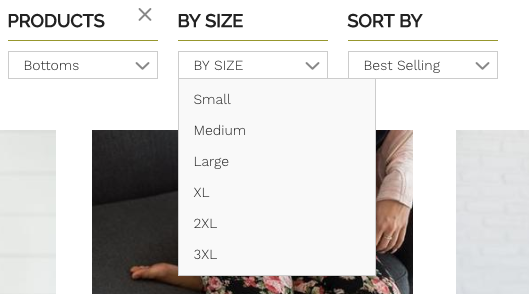 We do however support adding the filters as a row of drop downs on top of your filters. The install process for this is a bit different to the automated installed, and does require some minor theme modifications. However this also allows you to place the drop downs in an ideal position for your theme and design. To start, we need to find out of your have already installed the filters into your theme. If so we need to remove them. If you have a backup theme, then we would suggest working on the backup theme - don't worry we'll take a backup of the backup. We should now have a clean theme to start work on. Go to the Theme Installer, and select your clean theme. It may now prompt you to run the installer for that theme type, however instead we want to choose the Generic Theme with drop downs installer. Make sure you select to take a backup of your theme, just in case. code to your theme's collection page. There are no rules to where this code should go, however a good place is often after your collection description. You can edit your theme using the theme editor in your store. If you have any issues please contact support, we'd be happy to help.